Overcoming barriers to the widespread implementation of blue-green infrastructure and SuDS is challenging, particularly as many are systematic and embedded within organisational cultures, processes, policy and practices. 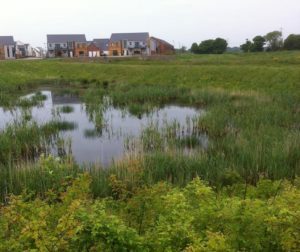 Nonetheless there are many examples in the UK of best practice blue-green infrastructure that demonstrate that the barriers can be overcome and schemes implemented to effectively manage water and flood risk and deliver a wide range of multi-functional benefits. SuDS pond in Newcastle Great Park. Over the past six years academics working on the Blue-Green Cities and Urban Flood Resilience research projects have focused on Newcastle as a UK case study, working with local practitioners on a range of research topics including; modelling urban drainage and flood risk, investigating public preferences, determining the impact of SuDS on sediment transport, identifying and quantifying the multiple benefits of blue-green infrastructure, evaluating the resilience of urban water systems under climate and population change, and assessing the interoperability of blue-green systems. In 2016 a pledge to support a Blue-Green vision for Newcastle and the NE was signed by representatives from Newcastle City Council, Northumbrian Water, the EA, Arup, Royal HaskoningDHV and Newcastle University (The Newcastle Declaration on Blue and Green Infrastructure). 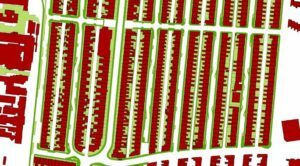 This confirmed their commitment to expanding the amount of blue-green infrastructure in towns and cities across the UK. They also pledged to provide local, regional and national leadership, encouraging and collaborating with others to increase the uptake of blue-green infrastructure and investigating alternative ways of working and funding models to realise multiple benefits. On 7th March 2019 these organisations will again come together in a free one-day event to showcase their progress with implementation of blue-green infrastructure in Newcastle and the wider NE. Blue-green infrastructure successes and ambitions will be presented and new organisations will sign the Declaration. 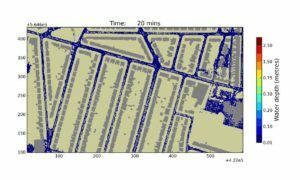 The Urban Flood Resilience team will also disseminate their research outputs and show how new urban water systems might be envisaged and transformed in order to deliver multiple benefits (including flood resilience) under flood, normal and drought conditions.